246 pages | 13 B/W Illus. Rising prison numbers on both sides of the Atlantic are cause for concern. Justice Reinvestment is a major movement in criminal justice reform in the US that is also attracting lots of interest in the UK. Justice Reinvestment is an approach to addressing the penal crisis that uses the best available evidence to re-direct resources to more effective rehabilitation of offenders and better ‘prehabilitation’. It takes a more holistic view of criminal justice and is particularly concerned to address the community dimensions of offending and re-offending. The authors highlight competing models of Justice Reinvestment and argue for a more radical version in which criminal justice reform is seen as part of a wider social justice reform programme. 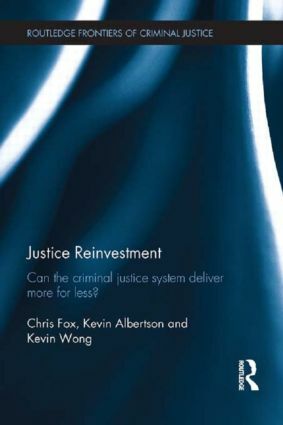 This is the first substantial publication on Justice Reinvestment and shows that ‘Justice Reinvestment’ has huge potential to re-shape the criminal justice system. It will be essential reading for undergraduate and post-graduate students with an interest in criminal justice reform. Practitioners and policy-makers working in the criminal justice system in the US and the UK will also value the fresh perspective it brings to criminal justice reform and its breadth of coverage including insights into the penal crisis, different models of Justice Reinvestment, the use of criminal justice data and research evidence in re-designing criminal justice services and new approaches to commissioning. 1. Introduction, 2. Rising prison numbers: the key challenge for criminal justice policy, 3. Justice Reinvestment overview, 4. A new approach to criminal justice policy, 5. Justice mapping, 6. Justice Reinvestment and evidence-based policy, 7. The economics of criminal justice policy, 8. New ways of financing criminal justice interventions: Payment by results and Social Impact Bonds, 9. Conclusion. Chris Fox is Professor of Evaluation, Manchester Metropolitan University. Kevin Albertson is Principal Lecturer in Economics, Manchester Metropolitan University. Kevin Wong is Deputy Director, Hallam Centre for Community Justice.